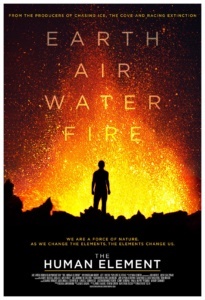 This is a community screening partnership between the Alexander Valley Film Society and Healdsburg Center for the Arts as part of their "Artists on Climate Change" exhibit. A panel, led by Supervisor James Gore, will immediately follow the film. The panelists scheduled to attend are Don McEnhill – Russian River Keepers, Marshal Turbeville – Geyserville Fire, Ana Lugo – Community Action Partnership (Latino Outreach during the October 2017 Fires), and Brad Sheerwood – Sonoma County Water Agency. During his four-decade career as a photographer and explorer, James Balog has focused his lens on the complex relationship between humans and nature. Human activity has now surpassed all other forces shaping our world. Balog's work has challenged us to contemplate our place in, and responsibility to, the natural world. Balog investigates how altering the elements is in turn affecting everyday Americans right now. The Human Element features subjects who are often overlooked victims of climate change. Balog visits Tangier Island, a fishing community facing the imminent reality of sea level rise threatening their future. We meet Yadira Sanchez and her three children in Denver, Colorado, all of whom suffer from asthma, and attend a special school for children struggling with air. Balog embeds with a Cal Fire strike team on the frontlines of the most expensive wildfire in California history. And he ventures deep into Kentucky coal country, meeting unemployed miners finding hope from a new source. Balog argues that humans are part of the whole system of nature and not apart from it. Knowing this, he finds great hope that the fifth element, the human element, can bring the whole system back into balance.